Three years after winning a $30 million federal grant, a 334-unit mixed-income housing community that weaves Larimer into East Liberty is in the second phase of construction. Phase one of Cornerstone Village includes 85 units on both sides of East Liberty Boulevard at Larimer Avenue. The new two- and three-story buildings occupy the intersection with a facade mix of brick and panels of red, umber, blue, green and yellow. They consist of townhomes and walk-ups, with a mix of one to four bedrooms. Some units have balconies. The first phase includes the leasing office, a community building with a fitness center, a computer room and a playground. Phase two will add 150 units bounded by Larimer Avenue and Broad Street. Phase three will jump deeper into Larimer. Cornerstone Village will provide a replacement unit for each unit lost in the razing of two 1960s public housing projects. East Liberty Gardens was vacated in 2016 and Hamilton-Larimer was largely vacant years earlier. The new housing will carry demand in East Liberty across the boulevard into Larimer. Phase-two units are already committed, with 1,000 people on a waiting list for phase three, said Sasha Gaye Angus, senior vice president of development for McCormack Baron Salazar, the St. Louis-based developer and property manager. 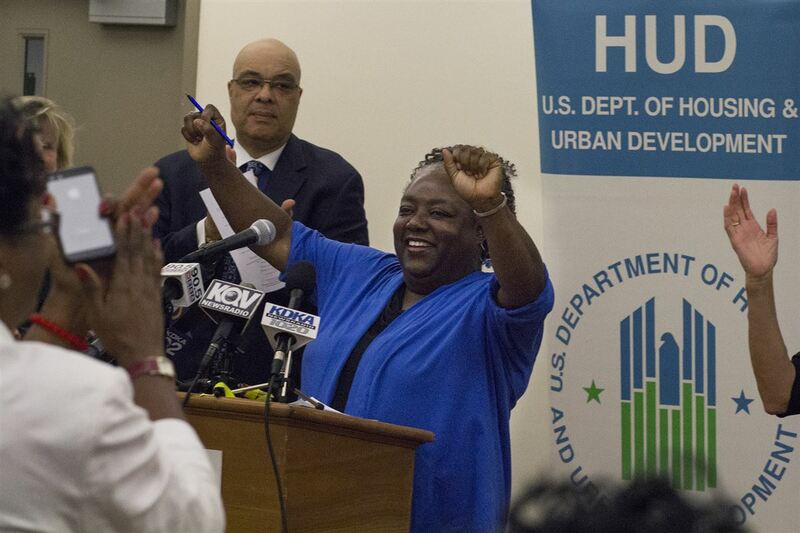 The catalytic grant in 2014 — a Choice Neighborhoods award from the U.S. Department of Housing and Urban Development — was a prize for Pittsburgh, one of four chosen among 43 applicants. The city committed $12 million over five years and the Pittsburgh Housing Authority committed $16.5 million. Low-income housing tax credits resulted in another $50 million from private investors, Ms. Angus said. The next phases — a third and possibly a fourth — will depend on additional credits. The entire price tag is $132 million, she said. The new federal tax bill, which was signed into law on Thursday, retained low-income housing tax credits at both the 9 and 4 percent rates, but with the corporate tax rate lowered from 35 to 21 percent, the credits will lose value and may dampen investors’ incentive to seek them. Phase two is expected to be completed in June 2019, by which time construction on phase three will have begun. Of the first 85 units, 28 are replacement units for the lost subsidized housing; 28 are affordable for incomes between 30 and 60 percent of the area median, and 29 are market rate. The second phase will include 75 replacement units; 33 affordable for incomes in the 30 to 60 percent range of area median income, and 42 at market rate. Ten percent of the units will be accessible to people with physical handicaps. The area median income is $54,080. The project has been awarded a green communities designation from the nonprofit Enterprise, which rates for environmental stewardship, energy efficiency and public health considerations, among a long list of criteria. Cornerstone Village incorporated stormwater management and energy saving appliances among its features. Investment in Cornerstone Village sought to bridge the economic gap between Larimer and East Liberty. Separated by a boulevard, East Liberty had become a destination neighborhood, while Larimer was economically fallow. But momentum in Larimer was already building in 2015, when KBK Enterprises finished 40 new affordable units, the neighborhood’s first new housing in 50 years. In addition to housing, a three-acre park will be built with funding from the Urban Redevelopment Authority on Larimer Avenue adjacent to phase one and Station Street. Jessica Smith Perry, the URA’s assistant director of housing, said the park should be built starting in the late summer or early fall. She said the budget has not been determined yet.